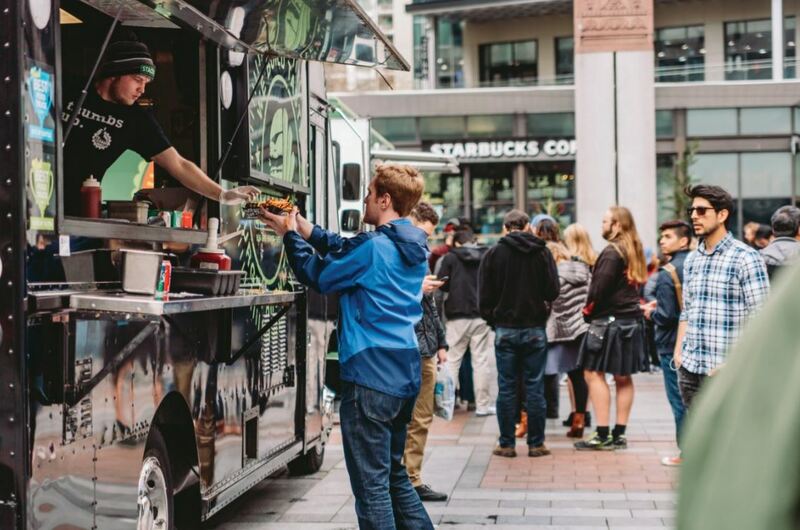 Any given week, as many as 300 food trucks roam the streets of Seattle. That may seem like a daunting number of options, but you can be dining at these rolling restaurants in no time. First, scope out the city’s food truck pods, set spots where a handful of trucks are regularly parked during lunch and dinner hours. Downtown’s Westlake Park (401 Pine St) often features favorites like Where Ya At Matt (whereyaatmatt.com) for New Orleans–inspired sandwiches and Off the Rez (offthereztruck.com) for Native American frybread tacos. Occidental Park (117 S Washington St) in Pioneer Square also entertains food truck stalwarts like fish-and-chips classic Nosh (noshthetruck.com) and burger master Bread and Circuses (eatbreadandcircuses.com). And the South Lake Union neighborhood boasts tasty options like Stacks Burgers (stacksburgers.com) for the hungry tech-worker crowd. Beyond the daily rotations, food trucks appear at events across the city. Fremont Sunday Market (3401 Evanston Ave, fremontmarket.com) hosts a handful of trucks. Think authentic Neapolitan from Veraci Pizza (veracipizza.com) and out-of-this-world treats from Galaxy Donuts (eatgalaxydonuts.com). If you’re all about variety, Mobile Food Rodeo’s (mobilefoodrodeo.com) monthly roundups and large-scale food truck festivals around the city may be more your style. Don’t miss Seattle Street Food Festival (July 7–8; South Lake Union) and Trucktoberfest (Aug 31–Sep 1; Magnuson Park). For a pint and a bite, head over to Seattle’s bevy of local breweries and taphouses like Chuck’s Hop Shop (multiple locations; chuckshopshop.com), which often have food trucks like grilled cheese aficionados Cheese Wizards (wizardsofcheese.com) and Anchor End Pretzel Shoppe (anchorendseattle.com) parked out front. And if you’re in the mood for something specific, look up trucks by neighborhood or cuisine type at SeattleFoodTruck.com. The website posts daily schedules for each food truck and notes gluten-free, paleo, vegetarian, and vegan options. Happy eating!